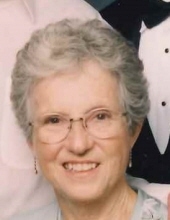 Jacqueline C. Cummins, age 90 of Rhinelander, passed away on Saturday, January 19, 2019, at her home. She was born on June 21, 1928, in Cleveland, Ohio to Eugene and Marcella (Gavin) Pfaff. Jacqueline graduated from Cathedral High School in Chicago, IL and then attended St. Anne’s Nursing School in Chicago where she earned her nursing degree. She was employed at St. Anne’s Hospital and then served as a registered nurse with the Chicago Board of Health. Jacqueline married Paul J. Cummins in 1949 and they resided in Chicago until retiring to Rhinelander in 1994. She enjoyed walks with her dog, bird watching, gardening, knitting, crocheting, sewing, and road trips with Paul. She had been a volunteer with Meals on Wheels and participated in Learning in Retirement classes. Jacqueline is survived by her children, Amy Cummins, Patti (John Tietjen) Cummins, Christine (Sean) Lynch, Margaret (Larry) McDermott, Paul (Diana) Cummins, Mary (Mike) Strenski, David (Kelli) Cummins, Peter Cummins, Brian (Leslie) Cummins, and Jackie (John) Grobe, 21 grandchildren, and 13 great-grandchildren. She was preceded in death by her parents; her husband, Paul on April 16, 2002; a sister, Patricia; and two brothers, Eugene and David. A funeral mass for Jacqueline will be celebrated at 11 a.m. on Thursday, January 24, 2019, at Nativity of Our Lord Catholic Church with Father Michael Tupa officiating. Visitation will be from 10 a.m. until the time of mass on Thursday at the church. Interment will follow in Northland Memorial Park. Carlson Funeral Home (715-369-1414 / www.carlsonfh.com) is serving the family. "Email Address" would like to share the life celebration of Jacqueline Celeste Cummins. Click on the "link" to go to share a favorite memory or leave a condolence message for the family.